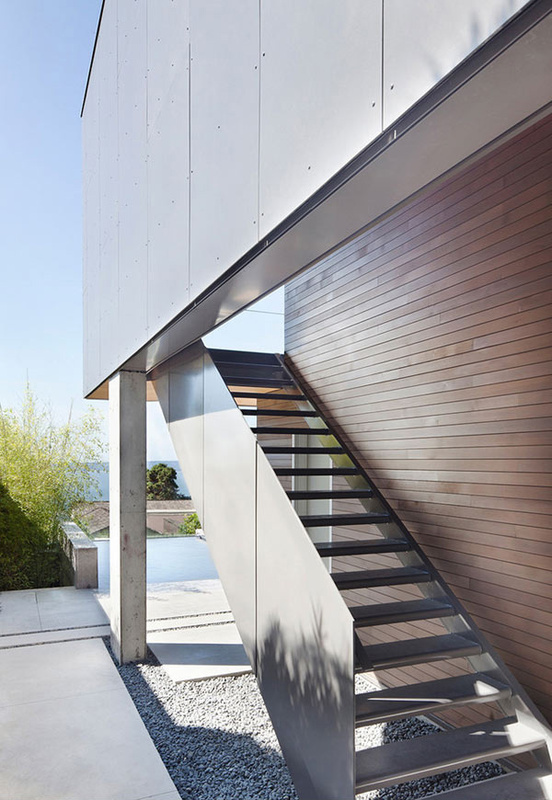 In West Vancouver, British Columbia sits a 4,600 square foot modern house with dramatic cantilevers. It is called the Russet Residence comprised of five bedrooms and five bathrooms. 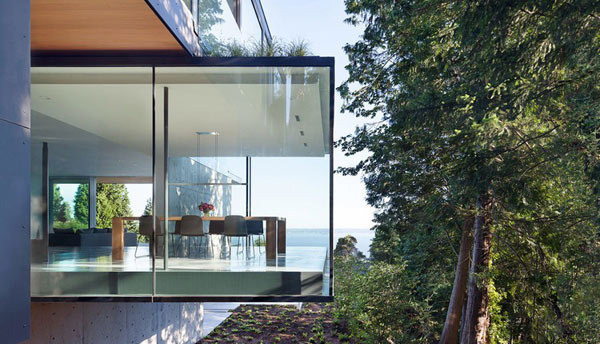 Its design responds to the conditions of the site as it is perched into the steep site with mature cedar and douglas fir to the west and an ocean view to the south. Its location gives it maximize views and connectivity to the landscape. The house was subject to strict environmental and geotechnical conditions because of its location. It needed to follow a required setback from the top of the back placing the foundation of the structure eastwards. Because the resultant footprint is narrowed, a portion of the upper floor as well as the main floor was cantilevered. Under and around the cantilevered area, native creekside vegetation grows which makes it look even more beautiful. You will love this house because of its stunning features! 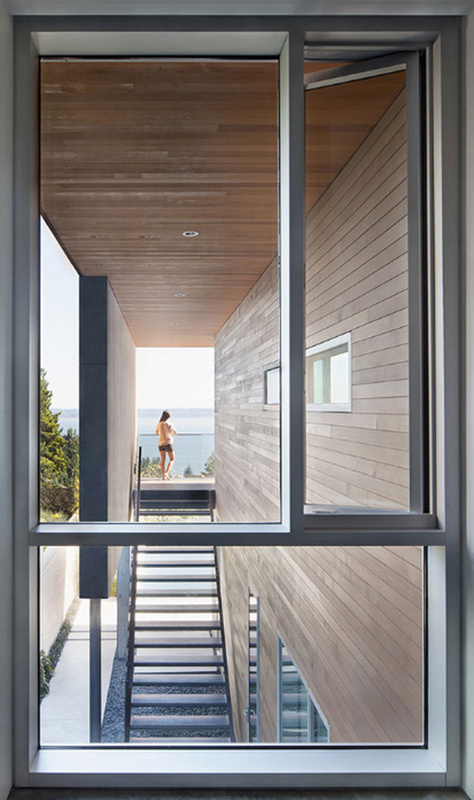 Take a look at the images of Russet Residence below. 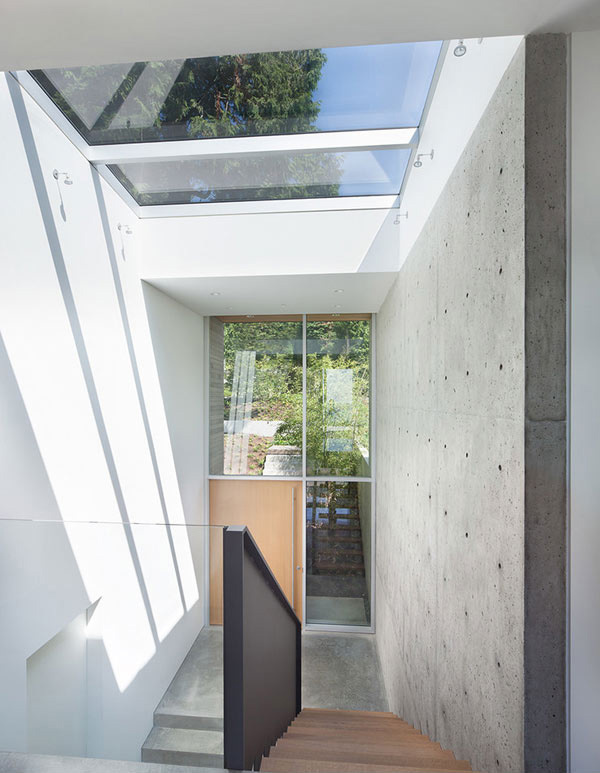 Despite the narrow floor area, the designers found a way to give more space to the house by adding cantilevered flooring. It actually made the house look even more gorgeous! A discreet overhang distinguishes the garage covered with Swisspearl which is a cementitious panel with integrated color that requires no painting. 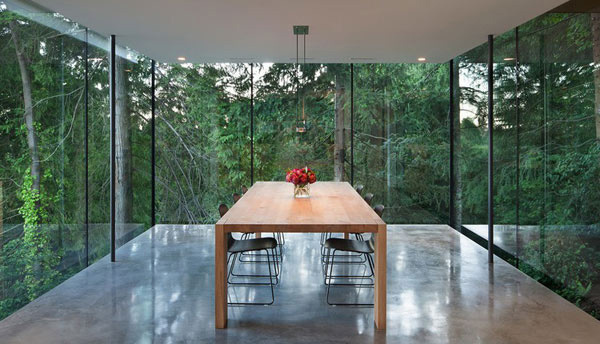 The dining room has glass walls that extend below the floor plane and above the ceiling plane. It cantilevers 15 feet from the foundation. 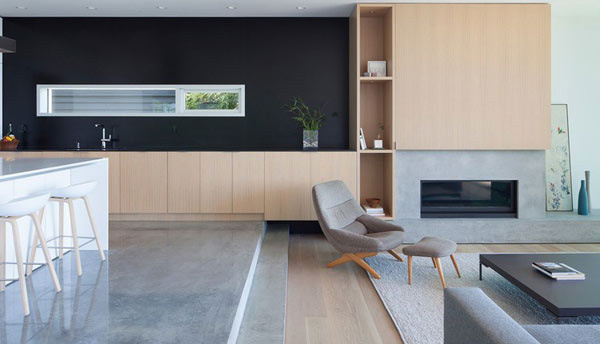 A simple and timeless living room is graced with a B&B Italia’s low-profile Charles coffee table and the Panavision proportions of the gas fireplace, which emits a ribbon of flames. 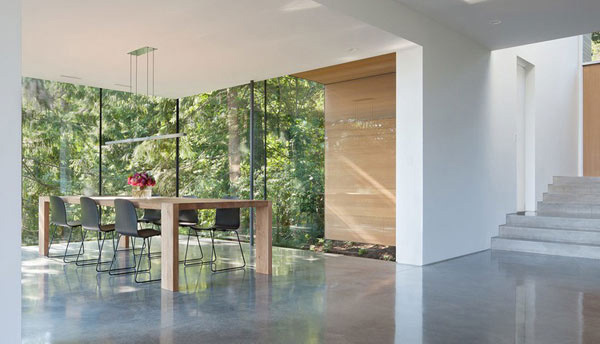 The floors in most of the interior of the house are polished concrete. One can see the forest from the dining areas as it is surrounded with glass walls..
White oak floors and cabinetry from Parish add warmth to the living room. 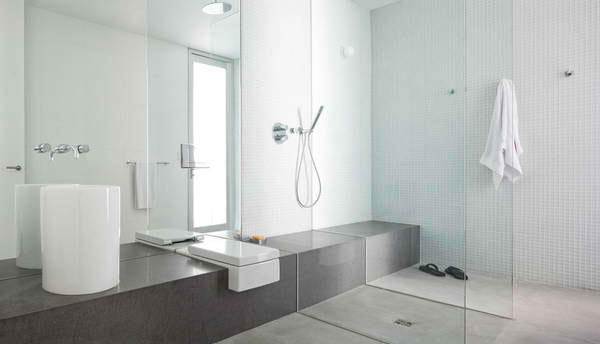 This is the guest bathroom off the pool which has a single stone bench that extends from the shower to the cylindrical sink. 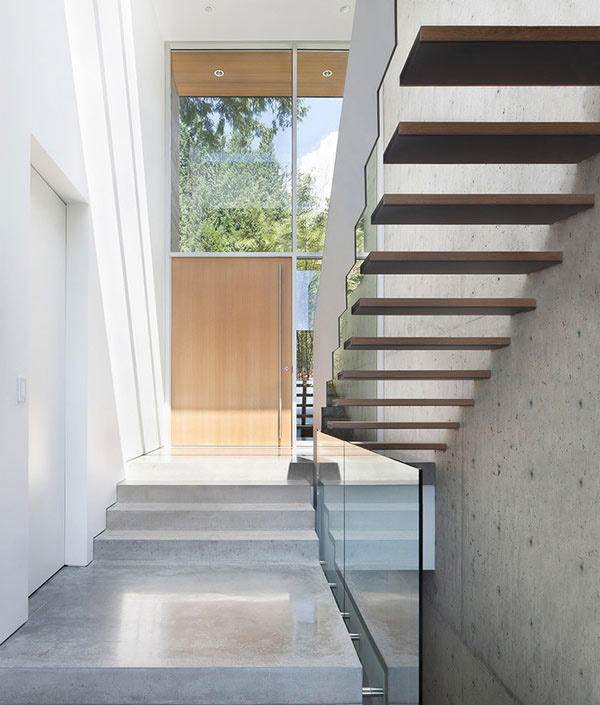 The stairs is supported with a concrete wall at the right but are not supported on the other end. 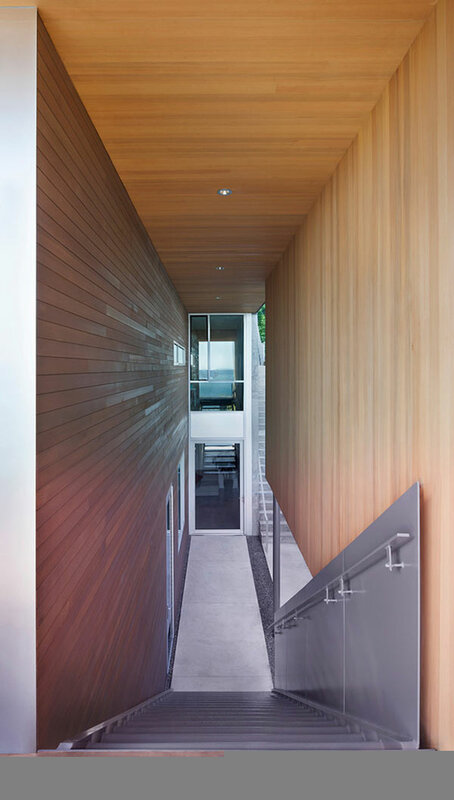 The front door opens into a split-level entry with a dramatic staircase comprised of white oak treads. A custom bed backs up against a white oak wall in the master bedroom. That wall divides the space from the dressing area behind it. One could get a glimpse of the topography of the site reveals itself as one descends the exterior stairs adjacent to the forest. The stairs lead to the upper floor and down to the main living spaces with a wall that rises up seventeen feet to help frame the bright circulation volume. A stairway on the east side of the house provides access between the living room deck and the yard and pool below. In most areas of the house, one will seemingly see himself with nature as it provides an ever-changing view of flora and fauna. 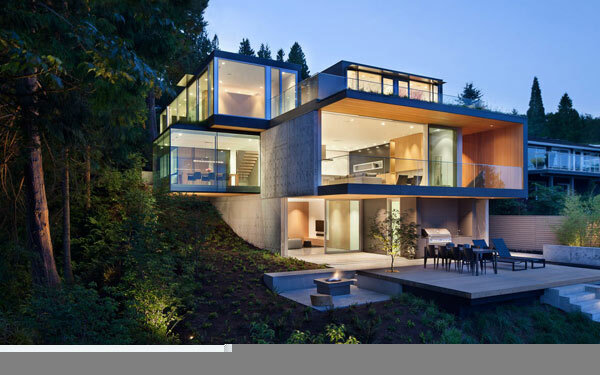 This is due to the usage of glass walls and windows all around the house. 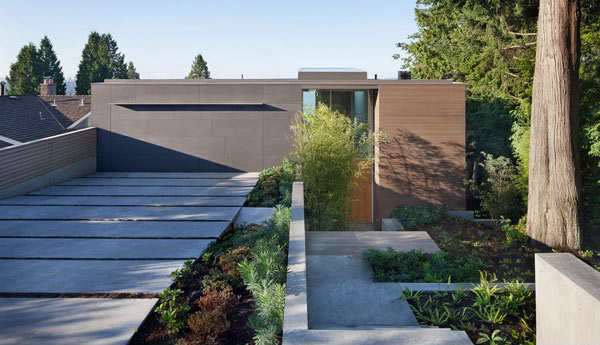 We love the idea of adding cantilevers to increase the space of the house. For sure, anyone who will see this will admire the work of Splyce Design because it really is impressive!